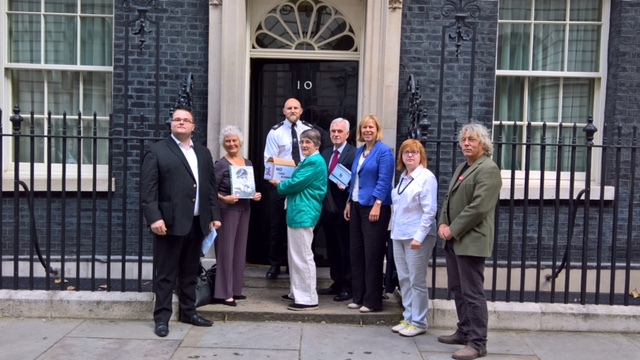 Residents who face losing their homes to make way for a third runway at Heathrow delivered 1,000 Petition cards to 10 Downing Street on Monday. Harmondsworth residents and anti-third runway campaigners were joined by Labour MPs john McDonnell and Ruth Cadbury, as the final decision approaches on airport expansion in the south-east. The petition cards were signed over two days at two local events in west London recently and called on Prime Minister Theresa May, who represents nearby Maidenhead, to oppose the expansion of the country’s largest airport. The visit to Downing Street sends a strong reminder to the Prime Minister that residents around Heathrow Airport are firmly opposed to its expansion – whether it is on the grounds of the destruction of thousands of homes, noise, pollution, costs to the taxpayer for the infrastructure or climate change. Stop Heathrow Expansion is a resident-led organisation that works to preserve the existence of areas around Heathrow Airport and the quality of life in areas beyond. It works in conjunction with other groups in the campaign against the third runway, including long-established anti-noise group HACAN.